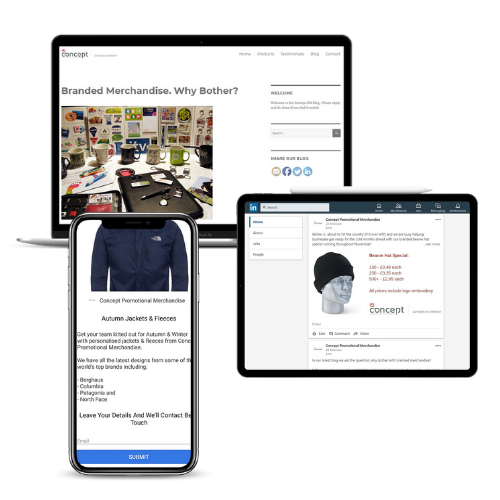 After a period of capital investment in 2018, clothing and merchandise branding specialist, Concept, contracted Who Dares to increase online awareness and drive leads amongst the business’ core target audiences. To achieve this Who Dares developed a content strategy (including the development of a new blog platform), a digital media campaign across key search and social channels (that included lead generation promotions on Facebook and LinkedIn) and used data analytics to measure effectiveness and refine activity. Average website user growth of 10% every month. Significant leads generated via targeted social media promotions. Key content reaching and engaging target audiences via LinkedIn. A 100% increase in blog visits through social media promotions. Who Dares has been working with Concept Promotional Merchandise for 3 months now and the attention to detail is second to none. They are very professional and focused on the project in hand and always offer invaluable data & statistics after each exercise. I would highly recommend Who Dares to any small to medium enterprise!